Advances in technology has made off grid ham radio a lot easier and more enjoyable. One of the most exciting developments is the relatively new lithium iron phosphate (LiFePO4) battery. New technology requires new knowledge, so we’ll be exploring LiFePO4 batteries and where they might fit (or not fit) into your amateur radio station. LiFePO4 batteries open up a new range of possibilities for the off grid ham, but it’s not as simple as replacing every battery you have with lithium. Deciding what type of battery to use requires walking a fine line of benefits and tradeoffs. With current technology there is no one single version of battery that is ideal for all applications. First things first: What is LiFePO4 and what is so great about it? Lithium Iron Phosphate batteries first came on the scene in the late 1990’s, and like most new technologies it took a long time for them to become practical and affordable. The lithium iron phosphate compound is very stable but does not have a particularly good intrinsic conductivity. To get around this problem, the compound is coated in a conductive material, usually carbon, to facilitate the electron flow. This arrangement offers numerous benefits. Perhaps the most meaningful benefit to the radio amateur is the constant discharge voltage. Traditional batteries start strong, and then the voltage slowly goes down as the battery discharges. Lithium batteries maintain their full voltage almost to the very end. 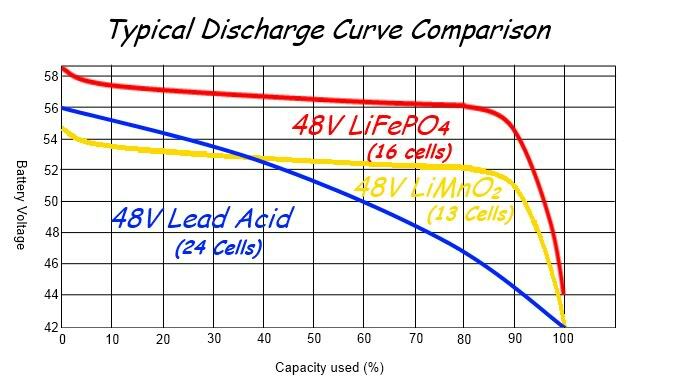 The graph below shows discharge curves for Lithium vs. common sealed lead acid (SLA) batteries. Notice that the LiFePO4 does not lose significant voltage until 90% of its capacity has been used. Chemical stability and thermal runaway. LiFePO4 is a very stable compound, which makes it much safer than other lithium based batteries. You may have seen news stories about lithium batteries spontaneously combusting in computers, kids’ toys, and commercial aircraft. There is no such thing as a battery magically catching fire for no reason. These incidents involved other versions of lithium batteries and were caused by overcharging, short circuits, or abuse that generates a lot of heat and releases oxygen, which further feeds the fire. This extremely dangerous cyclical process is known as thermal runaway and once started can be very hard to stop. Thermal runaway is nearly a chemical impossibility with LiFePO4 because the oxygen atoms share electrons in a very strong covalent bond. The bottom line: The harder it is to break the bond between oxygen atoms, the less likely it is the compound will become unstable, release energy in the form of heat, and catch fire. What you need to know: LiFePO4 is the safest, most chemically stable battery on the consumer market. It would require extreme negligence or willful abuse to cause a fire in one of these batteries. Energy density: What it really means. Radio amateurs who do a lot of portable or backpack operating will really appreciate LiFePO4 batteries. When you pick up a LiFePO4, it feels like there is almost nothing in it! They are as much as 60% lighter than their heavy metal-based counterparts. When weight is critical, LiFePO4 is the king of the hill. Nothing else is even sort of close. Another important trait of LiFePO4 batteries that ham operators will care about is energy density. Energy density is exactly what it sounds like: How much juice will fit in the box? A LiFePO4 has about four times more useable energy than a lead-based battery. This metric is impressive but needs to be examined more closely. The “four times more” claim is based on energy as a function of weight. But batteries are usually rated by amp-hours, not weight. A 10 amp hour conventional battery will have the same rated capacity and be roughly the same physical size as a 10 amp hour LiFePO4. That part does not change. What is different is the LiFePO4 will be a lot lighter and discharge at full voltage for a longer period of time. What you need to know: LiFePO4 is a no-brainer for backpackers and anyone for whom weight is a critical concern. For everyone else, the high energy density is a big plus but alone is probably not a deal-maker. Charge-discharge cycles and self discharge: LiFePO4 for the win! A big part of battery performance and economy is lifecycle, or, how many times the battery can be charged and discharged before it needs to be replaced. Older technologies such as nickel metal hydride and SLA batteries are good for a few hundred cycles, which is not bad for what they cost. LiFePO4 batteries will go to over a thousand cycles. LiFePO4 is also very resistant to self-discharge. Remember the old days when your NiCad batteries would go dead in a month or so just sitting on the shelf? That’s because they self discharge at rate of about 1% per day. LiFePO4 has a typical self discharge rate of 5% per month. In other words, it takes six months for a LiFePO4 battery to self discharge to the same level a conventional battery reaches in just thirty days. By the very nature of how we power our equipment, off grid hams have or should have a greater awareness of how energy production effects the environment. LiFePO4 batteries do not contain any heavy metals or toxic chemicals and, on the whole, are far “cleaner” than their ancestors. Yet once again, we need to pick apart the details to get the entire picture. I spent a lot of time digging for data on the environmental impact of LiFePO4 batteries and was disappointed at how little information is out there. Most of what I did find came from manufacturers and trade organizations. What they all said was pretty much what one would expect from a clearly biased source. Of course they claim that LiFePO4 technology is greener and cleaner than trees themselves! Piecing together the sketchy information, my best conclusion is that the content of finished product LiFePO4 batteries is very clean by battery standards, but the process for making them requires a lot of toxic acids and other nasty stuff. Keeping things in perspective, all other battery types also involve an environmentally questionable manufacturing process, so on the production end it seems like a zero sum game. If any Off Grid Ham readers can provide more complete environmental data, please forward it to me and I will update this article or possibly write a separate follow up article. The official editorial position of Off Grid Ham is that protecting the environment should never be an afterthought nor a minor priority. Passive concern is not good enough. As ethical citizens and amateur radio operators, we owe it to ourselves and future generations to preserve Earth’s natural ecosystems. What you need to know: LiFePO4 batteries come with a fair amount of environmental baggage but are still far greener than conventional batteries. Batteries are an inherently dirty business and LiFePO4 is the least dirty of anything currently on the market. The disadvantages of LiFePO4 batteries. If you think LiFePO4 is the gold at end of the battery rainbow, then this is the part where the fairy tale is busted. The most noticeable disadvantage is the cost. For example, An 8 amp hour sealed lead acid (SLA) battery that costs $12-$15 will run $95-$105 for a LiFePO4 version of the same battery. This expense is more than recovered in the form of a much longer service life. In that regard, perhaps it’s not really a disadvantage. Still, the idea of laying down a lot of cash up front in exchange for theoretical savings later is a not an easy sell. In addition to the cost of the actual battery, you’ll also have to invest in a charger specifically designed for LiFePO4. The chargers you already have will not work because LiFePO4 batteries have to be “cell balanced” and have different charge requirements than conventional batteries. There are resources on the internet about using conventional chargers, but for ease of use and practicality, use the correct charger. Some LiFePO4 batteries come with the regulating electronics built into them so they can be connected to conventional chargers. Unfortunately, most of them are designed for automotive/motorcycle use and are not appropriate for amateur radio applications. LiFePO4 also performs poorly under 32º F, so plan accordingly if you intend to operate in cold conditions. Scenario #1: The long lifecycle can create a situation where the battery outlasts the usefulness of the equipment. Suppose you decide to sell your radio, and the LiFePO4 battery is only partially through its useful life. You can sell the battery with the radio, but many potential buyers will not accept the presumed higher resale value of having a LiFePO4 battery in a used device. If you let the radio go for its normal market value and include the LiFePO4 battery & charger as part of the package, then you are giving up the balance of your initial investment. It’s like filling the gas tank on your car on your way to trade it in! Scenario #2: The battery cost much more than the equipment it is powering. If you have a $28.00 Baofeng handheld, are you really sure you want to spend twice as much on the battery as you did for the entire radio? With equipment costs getting lower and lower, and LiFePO4 still at luxury-level prices, things can get a bit distorted. If you want the benefits of LiFePO4 without replacing every battery you own, I suggest using one large 12 volt, 8 amp hour or larger LiFePO4 battery as a general purpose power source that can be plugged into any radio as well as charge other batteries. It is not dedicated to any single piece of equipment and down the road you can easily adapt it to new radios. You’ll still have conventional batteries in the rest of your gear, but it offers a lot of flexibility that can change with your needs. Key Points –What You Need To Know. Constant discharge voltage –will maintain steady output until the very end. Very safe, low fire risk. Environmentally friendly by battery standards. Will last for over a thousand charge cycles compared to a few hundred for conventional batteries. High up front cost offset by long service life. Performs poorly in sub freezing temperatures. May outlast the equipment it is powering. This research paper by Bruce Schwab is written for marine applications but provides a lot of useful information for amateur radio operators. Bioennopower sells LiFePO4 specifically for ham radio applications. WB4SON put together this great summary of LiFePO4 technology for ham radio. thermal runaway: In batteries, a cyclical process where excess energy is turned into heat, which in turn releases oxygen until the cycle starts feeding back on itself and cannot be controlled. This is a very dangerous condition that can result in an explosive fire. covalent bond: In chemistry, when two or more non metallic atoms share an electron. Covalent bonds are what make LiFePO4 batteries resistant to thermal runaway. self discharge: A battery’s natural tendency to lose charge via internal conductivity even when nothing is connected to its terminals. Every battery has some form of self discharge. Because LiFePO4 requires a high financial investment, the off grid ham should carefully weigh the pros and cons before laying out any hard earned cash. No one type of battery is ideal for all applications; you will likely end up with some combination of LiFePO4 and conventional batteries.